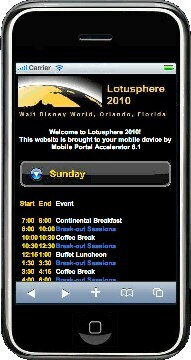 In about 24 hours I'll be getting into a plane to go to Lotusphere 2010 at Walt Disney World. As you know, I'll be speaking at BP301 - How Top Companies are Getting 'Out of the Box' with Lotus Connections 2.5. The session is Wednesday at 4:15pm so that's a sure place where you can find me. Another sure way to run into me is on Sunday, when we'll also be having a massive Tweet up during the welcome reception. I'll be there co-hosting the tweet up. For more details on location and time for the Lotusphere tweet up, see this post. If this is your first time going to Lotusphere, or if it's been a while, you'll want to listen to the Lotusphere Podcast. There you'll get various tips from fellow attendees on how to come prepared, what to look out for, and how to get the most out of your Lotusphere experience. I've heard that episode 5 of the podcast is the best (yes, that's the one where I'm interviewed). Want to go native ? There are also native apps for both your iPhone and Blackberry. On the iTunes App Store, search for LSMobile and in the Blackberry App World search for, well, LSMobile! So stay connected and follow @LotusKnows on Twitter for news, announcements, prizes, and more during the conference.